We have left behind the manicured, spotlessly clean countryside of Holland for France where grass verges are not always mowed, there is some litter and horrors, weeds in the fields. Our route took us through the Ardennes with beautiful picturesque countryside and lovely old stone houses. After driving for many hours we stopped for the first night in the first French town we came across, Givet on the river Meuse. We haven't driven for such a long distance in months. Its great to be back on the road. The weather has been improving all week so it was not surprising that next morning we woke to sunshine and a clear blue sky. The Ardennes was quickly left behind for rolling hills and large fields of wheat and corn. The weather held for a few days even though the wind was chilly. We first visited Arras in 1988 when the children were young. I love the old town square with its white buildings. A perfect place for morning coffee. One thing France has that is not available in Holland is a myriad of free parking areas for campervans. There is a book of these but we come across them very easily. The one in Le Havre was very busy. There is place for 19 campervans. We were the 35th to arrive! Still more came later and managed to find a spot. Naturally by this time many of the camper vans were totally blocked in but since they would all leave the next morning it wasn't a problem. That is until one van parked at an angle. A French camper van owner objected strenuously and chased them away. Everyone stayed nicely secluded in their vans, even us because the weather was rainy. We stayed 2 nights in Beuvron-en-Auge. It was quiet, sunny with plenty of space to sit outside. Frederic came by with his 2 nephews during the afternoon and discussed overlanding. He invited us to dinner at his mother's house. They were great company. His brother and mother have also traveled extensively and we had a lovely evening. The house was originally built around 1650, maybe earlier. It is in the typical local Tudor style but has been modernized inside. They told us that the combination of wood and stone came because of a lack of stone in the area. The buildings in the town itself were purchased from other areas by the first Mayor after WW2 finished to replace those lost during the war. The village is quaint. The reason why we have come to the Normandy coast is to visit the area between Honfleur, through Caen and Bayeux to Carentan. This is where the landing sites and museums related to Operation Overlord or the D-Day landings on 6 June 1944 are. There is a well marked route, lots of tourists, many very full camper van parking spots, and beach goers by the thousand. The British, Americans and Canadians all have museums, cemeteries and memorials. When you look at the landing areas you can understand why the Americans had so much trouble at Omaha Beach. There are hills from where a good defense can be mounted. There was also a point with a gun emplacement which overlooked both Omaha and Utah beaches. Pieter went into the Museum at Utah Beach. I am not very interested so stayed outside and people watched. We also stopped to look at various old military equipment set up along the way as memorials. The big memorials were very impressive. The Canadian Monument is in the shape of the Oak Leaf. The American Memorial at Omaha has 3 elements: the wings of hope, Rise Freedom and the Wings of Fraternity. Next stop was Le Mont St Michel. I have visited it on my tours around Europe in the 1970s. I would have liked to do so again but the parking was crowded, people were everywhere and the parking is expensive. I don't know how much the entrance fee was. Needless to say I gave it a miss. Maybe one day in the off season. The weather might even be much nicer! The plan was to visit Brittany. The bad weather sent us south instead. And the weather did not improve until we came to Languedoc. Even then it was raining at times. At least the wind was not bitingly cold. The melting ice in Greenland is doing a good job of messing up the Atlantic currents and sending Europe into an Ice Age. The scenery in the Languedoc is lovely - mountains, hills, gorges with many green trees and fields. In the north west are the Cervannes where villages nestle near small rivers. Further down are the Montagne Noire with the spectacular Gorges de Galamas. The road that goes along the gorge is one way with no stopping allowed and is controlled, at least in season. People walk along the gorge and swim in the various pools. The Midi Canal joins the Mediterranean at Sete to the Garonne at Toulouse (240K) and thence to the Atlantic. The challenge at the time was to bring water from the Montagne Noire to Nauouze the highest point along the route. It was built over 15 years from 1667 to 1681 and is still in use. Various locks allow boats to go up and down according to the landscape. The ones we visited were at Beziers, Colombiers and Castelnaudery. 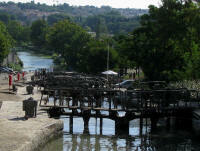 The 9 locks at Fonseranes in Beziers allows boats to go up or down 21.5 meters in a very short distance. The 4 St Roch locks at Castelnaudery only allow a mere 10 meter change over a much larger distance. It was fascinating to watch he working of the locks and various skills of the boat crews. Languedoc is Mary Magdalene and Cathar country. Legend with some historical facts says that Mary Magdalene came to France after the death of Jesus. She landed at either Marseilles or St Maries sur Mer. Jesus, having survived his crucifixion, may have come with her. Whatever the truth she has a large following with many churches dedicated to her. The most well known is probably Rennes le Chateaux. In 1885 Father Berenger Sauniere was sent to the parish of Rennes-le-Chateaux. Within a few years he restored the church, set out gardens and built a villa for guests. The great mystery is the origin of the money. During the last years of his life he was involved in a court case with the Roman Catholic Church which wanted to know the source of his funds. Mary Magdalene's teachings were based on love, humility and knowing God through your own heart. It is possible that these teachings were the basis of the beliefs of the Albigensians or Cathars as they later became known. The crusade against the Cathars had its seeds in the 11th century when Pope Gregory VII (1073 to 1085) reformed the church, freed the papacy from secular authority and became a virtual monarch. The concept of the fight between the Archangel and the dragon (devil) was brought into Christianity. The Pope preached a Holy War against the forces of evil and demonized the infidel in Spain and the Holy Land. The Crusades followed. 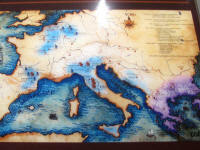 By the 12th century a parallel church was emerging in France and Italy. Their beliefs were based on the New Testament, particularly John. Followers used the local language to make the bible accessible to everyone. They believed in a Christian dualism as in the opposition of God and the World. They believed the souls of men (and women) were the agents of good dragged into this world against their will where they did not belong. Preaching focused on Jesus who was divine, his humanity only an appearance, a messiah not an expiatory victim. The souls will return to heaven through humility, truth and faith. Reincarnation will occur until the soul is ready to be re-united with God. Hell, the realm of the devil, is transitory, it is the world we live in. They practiced a single sacrament in the name of Christ. This covered penitence, baptism, confirmation, ordination, consolation on a deathbed and marriage (in the sense that this reunites the fallen soul with the holy spirit). Unions between men and women were not considered a sacrament. They did not accept the concept of the body and blood of Jesus being present in the host served during communion. Children were not baptized. They scorned superstitious cults like relics, penitence and crosses. They had their own Priests and Bishops who did not accept the Pope as their leader. Ooops! The crusade against them, called by Pope Innocent III, is the first recorded genocide, at least in Western History. It was a war of conquest by the French King and an instrument of religious intolerance and totalitarianism by the Roman Catholic Church. It started in 1209 with a massacre at Bezieres and ended in 1229 with the Treaty of Paris. The French King had won and now ruled the land but the Church had not eradicated the Cathars. They went into hiding in France (Houtpoul and other places) and Lombardy in Italy. This heralded the development of the inquisition. In 1233 Gregory IX created the inquisition to eliminate heresy. They were attached only to the Pope with the roles of confessor, interrogator and judge without appeal. It was run like a modern bureaucracy, taking statements and having case files. Torture was made legal in 1252 but the death sentence was handed to the secular arm as the inquisitors were clerics and had vowed non violence! Inquisitors killed less people than during the actual crusade. It was a lucrative business as property was confiscated and split between the secular arm (the king and his vassals) and religious judges. It took them a century to destroy the Cathars. The above information came mainly from the Cathar Museum in Mazamet. Personally I find the history of Christianity fascinating. Especially after reading the books by Zecharia Sitchin and various books about Mary Magdalene. Ah Cadaquez! 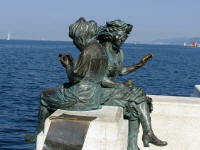 Pieter first visited this sea-side town in the north of Spain long before he went to South Africa. We came here with the boys over 20 years ago and more recently in 2005. 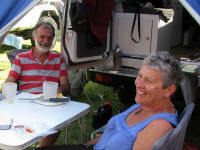 It is a lovely Mediterranean town with a reasonable campsite 100 meters up the cliff from the water. There is even shade at the campsite. The trees have grown in 20 years! A great place to spend a few days relaxing and thinking about Languedoc. Then Valencia and a visit to Doreen and Alec, friends we made in Spain in 2005. It is always lovely to see our friends. The route back to Languedoc went through the Pyrenees and Andorra past old fortified towns, hills, mountains and valleys. Our wild camps were lovely. So good we stayed a couple of days in some. Unfortunately we were not the first to find these idyllic spots. I really wish women would take their little bits of paper with them and put it in the rubbish bin. The paper really spoils places. Andorra is still a place the Spanish go for cheap goods. It was very busy. We sat with a cup of coffee and watched the hustle and bustle. Pieter made good use of the opportunity and bought some whiskey cheaply. Villefranche-de-conflent was our first stop after Andorra. It is classed as one of the prettiest villages in France. It is a walled town with a castle way up on the hill connected by a tunnel. There is now a train line between the village and the hill! The village was founded in 1092 but the walls and fortifications are from the late 17th century. It is very touristy. Each house has a shop at the bottom with restaurants where ever there is space. Even so it was interesting to walk around. Marcevol Priory is nearby. Built in the 12 century it overlooks the fertile well watered Tet Valley. The mother of a Pope is buried in the church yard which ensured it became a stop on the Road to Santiago - a pilgrimage route. The portal was interesting, made mainly of pink marble. 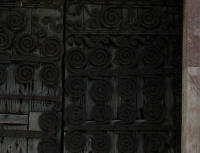 The wooden door has decorative spirals nailed onto it for strength. Since the wood looks very old I guess it works. Queribus castle stands at the very top of hill, difficult to approach by foot. It can be seen for miles around. It was the place where one of the last Cathar priests was captured. Peyrepertuse can also be seen from a long distance if you know that it is built along a ridge. Both have great panoramic views but take effort to walk around. I went through Queribus but decided one was enough for the day. Aguilar is the only castle where Pieter joined me. All 3 castles were part of the Corbiers border fortifications during the 13th to 17th centuries keeping watch on Aragon (Spain) just to the south. We skipped the bigger cities like Montpellier and Nimes after we spent hours driving through Sete looking for a parking spot. The traffic was horrendous. NOTE we did not drive up and down streets, just took the main street through! Agues des Mortes has a very appropriate name. It has been an area where salt has been collected from very early on. Salt collection is still going on today. Interesting to watch. Beaucare has been around since Roman times. Its claim to fame is that there is still a winery making wines in the Roman tradition. The wines have honey and herbs added and are generally very sweet. Certainly not to my or Pieter's taste. The last place we visited on our way through Languedoc this time round was the Pont du Gard. It is part of a Roman aqueduct that stretches 50 kilometers from Uzes to Nimes, most of it underground. The Pont du Gard was built over a river and is very impressive. Apparently it had to built up soon after it was made to improve the water flow. The Romans needed extra water for their numerous baths and fountains. It provided 1,000 liters of water per person per day. The French now only use between 300 and 400 liters per day. It was in use for about 150 years and leaked from the very beginning. We watched a movie there, assuming it would be about the history of the aqueduct. Instead it was purely promotional and only in French. The museum on the other hand was fantastic. The tools and measuring devices were on display plus some of the original mechanisms used to regulate the flow of water plus short movies simulating the workers building the aqueduct. Onto the highway to get some kilometers under our belt. The tolls are high but you are not constantly going around traffic circles. 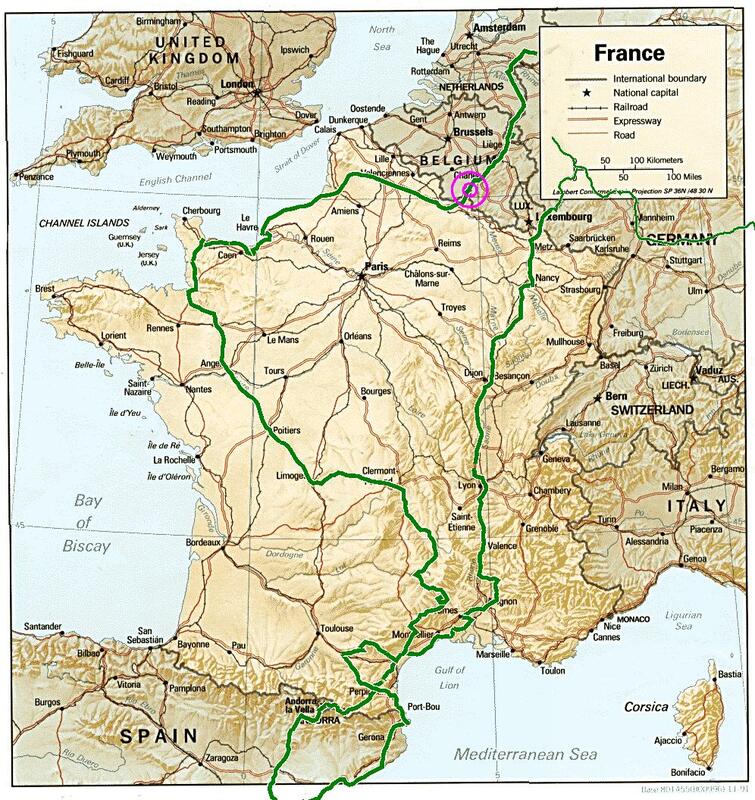 One day and you are halfway through France. We made such good time we spent a few days in a little town, Thionville, relaxing and catching up on the usual chores. The Willy's Treffin in Germany was well worth it. Around 700 vehicles were crammed into part of an aerodrome. It was quite orderly but there was not much space left. Latecomers had to execute multiple point turns to squeeze in - quite something to watch when it is a large truck. There were many truck style campervans. Some trucks had a caravan on the back bed, others were specially designed. There were half a dozen Toyota Land Cruiser Troop Carriers all set up in a similar fashion to ours. It certainly gave us some ideas for additions. Our basic layout is pretty good. We spent our time chatting to other travelers. Most of the attendees had not been outside Europe, let alone Germany. If they went anywhere it was to Morocco. Those that had traveled had interesting tales to tell. There were some presentations given by volunteers. We only attended one on Siberia by Rudi Kleinhenz. It was perfectly understandable even though it was entirely in German. The one word I did understand was continually repeated - mosquitoes! The pictures told the story. Afterwards I asked for more details on shipping from Magadan to Vladivostok etc. Definitely worth attending. After a quick detour to Holland to fill up the gas bottles we headed for Trieste. 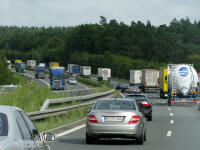 The route was once again on highways, no tolls though. The roads are very good and relatively level. This is achieved by building bridges over every valley and occasionally putting in a tunnel. There was a BMW get together in southern Austria. There must have been thousands of bikes attending. We constantly passed groups of 20 or more all heading to Austria. The number of trucks going in both directions was also quite amazing. I estimate 90% of the traffic consisted of trucks. One of the jobs we attended to on the way was repairing the exhaust. Pieter had tried in Holland but they did it their way! In Germany we tried again as the exhaust was starting to fall off. They managed to secure the exhaust but once again insisted on fixing the hole their way. Later Pieter had another go, only to find that the exhaust had not been secured properly although all the required bits were there. At least he could secure it properly. The hole will have to wait a little longer. We will have to find somewhere where they are prepared to do it properly. This is the type of problem you have with non standard equipment. Trieste is a lovely town, with lots of side streets and beautifully decorated old buildings. The sun came out for us and it was lovely and warm. At last!